As a nurse, you have to wear scrubs, but you don’t have to look like every other nurse on your floor or in your office. From choosing the cut and color to customizing your scrubs with embroidery and emblems, there are multiple ways to update the look of your favorite work clothes. Below, we break down the various possibilities for adding embroidery and emblems to your scrubs. 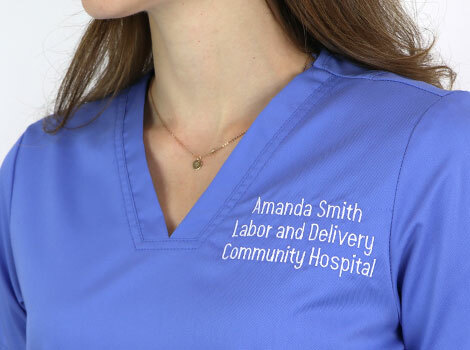 At allheart, scrubs can be easily customized with embroidery and emblems. But a host of other medical wear products can also be updated with custom stitching as well: solid-colored tops, solid-colored jackets, T-shirts, lab coats, and even blood pressure cuffs and nurses’ kits. Embroidery doesn’t show up well on boldly patterned or printed garments, so that’s why customization is only offered for solid-colored products in some categories. Embroidery generally refers to words stitched on a garment, such as a hospital’s name or a nurse’s title. Text options include your choice of block or script fonts. Text may be stitched on one, two, or three lines stacked on top of each other, and up to three lines of text may also be paired with an emblem. For items like scrub jackets and lab coats, you may want personalized stitching in multiple locations. Keep in mind that some characters can’t be used in embroidered text. 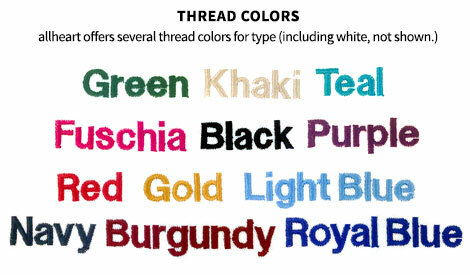 Thread is available in more than a dozen colors, including red, gold, green, purple, blue, white, and black. The most popular text style and thread color combination is block text in black thread. Emblems are small icons or graphics that can be stitched alone or above text. Thread color cannot be modified for emblems. Some of the emblems we offer include classic symbols of various specialties, such as chiropractors, dentists, nurses, veterinarians, and hair dressers. Emblems of objects, such as toothbrushes and ambulances, are also available to add to your customized scrubs. 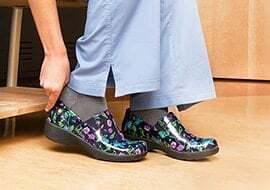 If you work with children in a pediatric practice, you’ll also find a collection of fun stick figures and other cartoon-like emblems that add a note of cheer to your scrubs. There are several factors to consider when choosing what to embroider on your custom medical uniform. First, you should decide what text you’d like on your scrubs. Of course, you can always opt for just an emblem by itself, without text, if you prefer. Most nurses and other medical professionals want at least their name on their scrubs, and many choose to include their title as well, for two lines of text. If you work in a larger hospital, you might also want to include a third line specifying your department — for example, pediatrics or radiology. Then you’ll need to choose a text style and thread color. Block text is generally easier to read, but script font adds a bit more of a design element to the embroidery. Generally speaking, light threads show up best on dark garments, and vice versa. 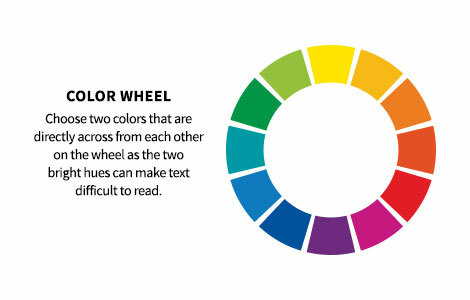 However, you might not want to choose two colors that are directly across from each other on the color wheel, as the two bright hues can make text difficult to read. You’ll also want to consider whether or not you want to coordinate the color of your embroidery thread to the color of your emblem, if you’re including one alongside the text. Because the color of emblems can’t be changed, it’s important to choose a solid-colored scrub so that the emblem shows up well. You’ll also want to consider what category of emblem you’d like. 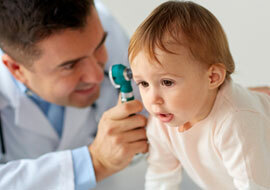 Would you prefer one directly related to your medical profession, such as the nurse’s cross symbol? Or perhaps something more general and classic, such as the Staff of Aesculapius? You can take a different approach and add a pink ribbon for breast cancer awareness, or a funny stick figure wearing scrubs if you work with kids. Keep in mind that the emblem will be placed directly above your text. Note that all garments can be personalized on both sides, so you could have an emblem on one side and text on the other, for example. Not only can you choose the fit and color of your scrubs, you can also customize them further with embroidery and emblems. Scrubs may follow the same basic design, but adding embroidery and emblems will set yours apart, and ensure that you never get them mixed up with someone else’s.